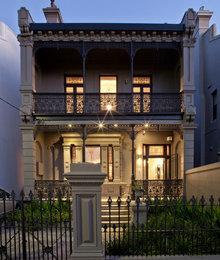 Wrought iron has been used in Australian design and architecture since the 1850s. Cast and laser-cut in various forms and patterns, and developing its own patina with age, wrought iron fits a number of domestic styles and can evoke a sense of the traditional or contemporary, rustic or stately, raw or finished. 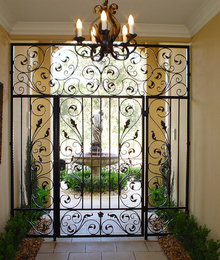 Here, we preview five ways to use wrought iron in your home and garden, including balconies, gates, banisters, screens, and sculptures. From simple to elaborate, there’s something to suit everyone. 1. BALCONIESFrom simple…Australia established its own iron and steel foundries in the 1850s, at the time of the gold rush and mass building booms. With the capacity to wrought iron, developers and architects no longer needed to import it from Britain, aiding the development of Australia’s industry and craftsmanship.Commonly seen on the balconies of Victorian- and Federation-style homes, wrought iron is used functionally and decoratively for railings, valances, balustrades, and fretwork. 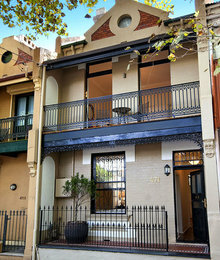 A simple geometric form was used in these Surry Hills, Sydney, terraces. … to elaborateMany a city terrace features far more intricate and decorative wrought-iron work with curving and flowing interlocking patterns that gussy up the facade.But no matter what style and shape the balconies take, it’s hard to imagine what our city terraces would be like without wrought iron. It adds interest, colour and detail to what are often otherwise standard architectural forms. 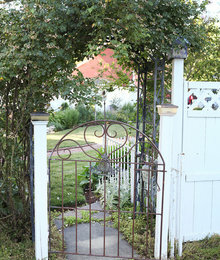 …to elaborateOr you could make a grander, more formal statement with an impressively-sized and magnificently detailed wrought-iron gate, more fitting to an interior or transitional space within the home. 3. 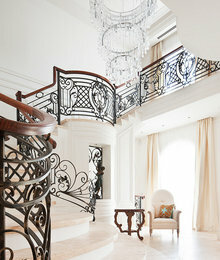 BANISTERSFrom simple…A simple wrought-iron banister is timeless and elegant. It can fit a multitude of interior styles from rustic and traditional to modern and contemporary. It will be both noticeable and subtle due to its simplicity and, as in this interior, its brings a sense of strength and solidity to any staircase. … to elaborateIn contrast, ‘regal’ is the word here. If you like to make an entrance, this banister is for you! 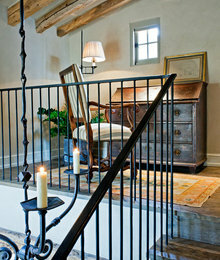 Against a neutral backdrop this wrought-iron banister is a standout. While it twists and turns its way up a large curving staircase, it will twist and turn the heads of anyone who enters your home. 4. 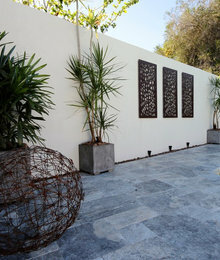 GARDEN SCREENSFrom simple…This concrete space was transformed into an inviting modern garden with wrought iron screens, paving tiles, and well-planned plantings. 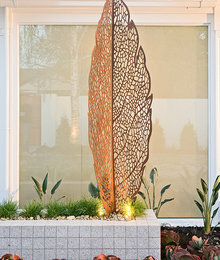 Scenes or patterns cast or laser-cut into wrought iron add simple but visually interesting detail to any space. Displayed outside it will develop its own unique patina over time. These screens have spotlights in the garden at the base of them and, when they’re turned on at night, the light makes a spectacular show of the patterns. 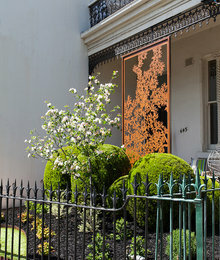 …to elaborateThis wrought-iron panel functions not only as art but also an effective privacy screen adding an extra layer between the interior of the home and the pavement outside. It is designed to harmonise with the wrought-iron detail on the terrace, and to mimic the blossoming garden. It helps link the indoor living with outdoor areas and, come winter, it will add life to the garden until the flowers return in spring. 4. SCULPTURESFrom (not so) simple…This unique wrought-iron sculpture catches the eye. 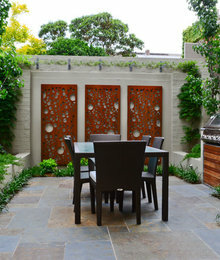 Freestanding, laser-cut and in a natural rust finish, it is a focal point of this garden helping to invoke a sense of quiet relaxation.